The return of J. League action is unlikely to ease the disappointment for soccer fans still sore from Japan’s dismal World Cup showing, but a glut of goals as the league resumed in full on Saturday at least provided a welcome distraction. 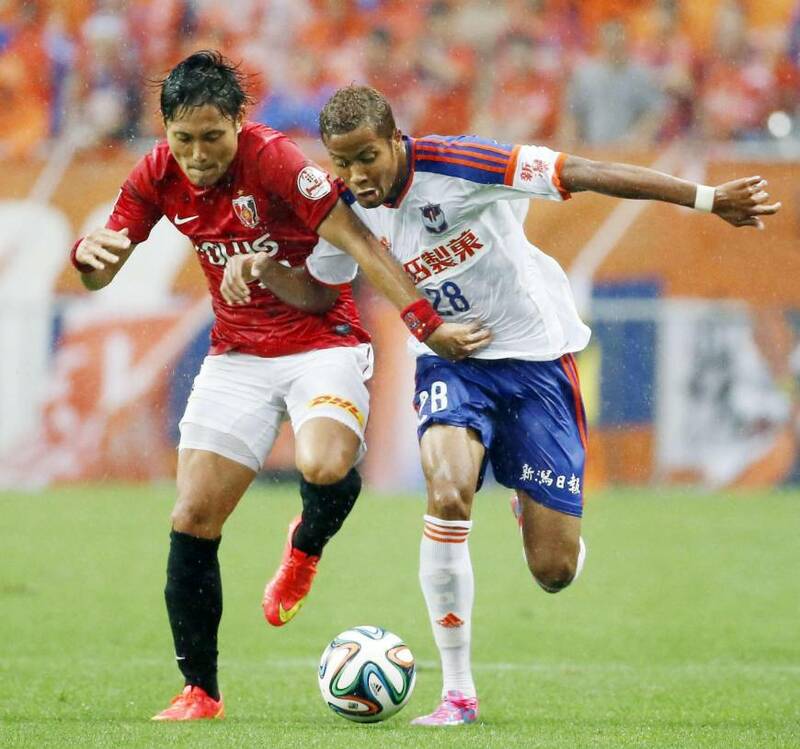 Urawa Reds carried on from where they left off when the J. League entered its two-month shutdown in mid-May, beating Albirex Niigata 1-0 on Saturday to stay one point clear of Sagan Tosu at the top of the table. Reds have now kept a clean sheet in each of their last six games, equaling the all-time J. League record set by Shimizu S-Pulse in 1993 and matched by Yokohama Flugels three years later. “In the first half we played the kind of football that we have been aiming for,” Urawa manager Mihailo Petrovic said after a 16th-minute own goal had given his side its 10th win of the season. “We play the ball out calmly from the back and then work it forward with high quality. When we lose the ball, we switch immediately toward trying to win it back. Surprise package Sagan showed they have no intention of letting their excellent start to the season fade after beating Vissel Kobe 1-0 to stay right on Urawa’s coat tails in second. The Kyushu side may not always be the most attractive team to watch, but a league equal-best goal difference of +12 proves that Tosu is doing things right at both ends of the pitch. Frontale did their own cause no harm with a 2-0 away win over Shimizu S-Pulse to add to last Tuesday’s 2-1 win over Cerezo Osaka, while Kashima Antlers moved up to fourth after Yuto Toyokawa’s 86th-minute equalizer gave them a 1-1 draw with FC Tokyo. The arrival of the intense summer heat makes it difficult to predict how teams will cope from now on, but at least the World Cup shutdown has given each side plenty of time to work on physical conditioning. With the games coming thick and fast over the next few weeks, they will need all the help they can get. Omiya Ardija fans have had little to shout about so far this season, but the halftime appearance of new signing Dragan Mrdja in Saturday’s 3-3 draw with Sanfrecce Hiroshima offers hope for the rest of the campaign. Serbian striker Mrdja, who arrived from Red Star Belgrade at the start of the month, replaced Takamitsu Tomiyama at the interval with Omiya 3-0 down to defending champions Sanfrecce, and the 30-year-old’s impact was nothing short of game-changing. Mrdja scored twice as Ardija fought back to claim a 3-3 draw, and the debutant was delighted with his evening’s work. Another player making his debut on Saturday was Nagoya Grampus’ new signing Leandro Domingues, whose transfer from Kashiwa Reysol got somewhat lost in the shuffle with the nation’s attention distracted by the World Cup. Leandro, the 2011 J. League player of the year, started in midfield for Akira Nishino’s struggling Grampus in Saturday’s game against Tokushima Vortis, but the Brazilian could do little to turn the tide as Nagoya managed only a 1-1 draw against the division’s whipping boys. — New Cerezo Osaka manager Marco Pezzaiuoli gets his first taste of the J. League in Saturday’s 2-2 draw with Yokohama F. Marinos.